NEW YORK (AP) -- Major League Baseball would like to make changes in the player acquisition agreement with its Japanese counterparts. MLB and Nippon Professional Baseball agreed to the posting system in December 1998 in which Japanese clubs can make available players over which they have control. MLB teams bid, and the player's Japanese club receives the posting fee only if he reaches agreement with an MLB club. "We certainly have begun conversations about changes to the posting system," MLB Commissioner Rob Manfred said Thursday after an owners' meeting. 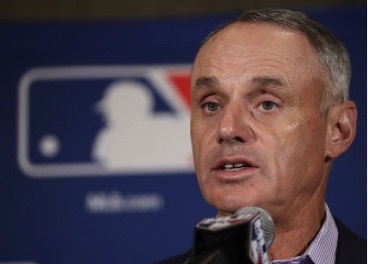 Manfred said the hoped-for revisions have been sparked by changes to MLB's collective bargaining agreement and a desire to have "more of a uniform system that applies to professional players in particular that are moving to Major League Baseball." "It's just too early to give you some indication as to precise timing," Manfred said. "We certainly would love to have a new system in place for the signing season 2017-2018." Under the posting system, Boston obtained pitcher Daisuke Matsuzaka from the Seibu Lions before the 2007 season for $51,111,111.11, and agreed to a $52 million, six-year contract, and Texas got pitcher Yu Darvish from the Hokkaido Nippon Ham Fighters before the 2012 season for $51,703,411 and gave him a $56 million, six-year deal. A change during the 2013-14 offseason capped the fee payable to the Japanese club at $20 million and allowed a player to negotiate with all big league teams willing to pay the posting amount. The New York Yankees paid the maximum to the Rakuten Golden Eagles for pitcher Masahiro Tanaka and agreed to a $155 million, seven-year contract before the 2014 season.